Dr. Kantorovich was a general dentist for 8 years prior to entering post-graduate training in endodontics at Case Western Reserve University, where he received a Certificate in Endodontics, and a Master of Science in Dentistry. Since 2004 Dr. Kantorovich has been in full time private practice limited to endodontics in Lakewood, OH. He holds the position of Assistant Professor at Case Dental School where he volunteers his time teaching in Graduate Endodontics. 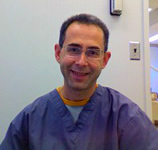 Dr. Kantorovich is married and has three children. When he is not serving the needs of his patients, Dr. Kantorovich enjoys music, travel and competitive ballroom dancing.